Audi’s premier road car has been given a comprehensive makeover by the German tuning specialist. Following their tuning package for the Audi R8 GT coupe, German tuning specialist Wheelsandmore has returned with a program for the limited-run V10-powered GT Spyder. The focus of the tuning job was to make the supercar lighter and more powerful, something Wheelsandmore achieved by preparing a special performance package made up of a lighter stainless-steel exhaust system with remote-controlled valve flaps, 40 percent lighter than the standard gear. 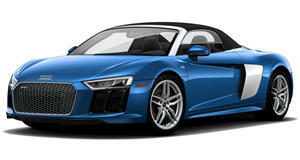 Special carbon-frame air filters and a reprogrammed ECU boost output to 620 horsepower and 435 lb-ft of torque and further optimize the power-to-weight ratio of Audi&apos;s most extreme roadster. Suspension was another important aspect of the tuning package, which is why a KW-Automotive LCS (level control system) hydraulic lift-up system was installed. Drivers can increase road clearance by over 40 mm via remote control, with independently-adjustable rebound and compression damping give owners flexibility with their suspension set up. Completing the package is a set of handcrafted 3-piece ultralight forged 6Sporz alloys that can be finished to customer&apos;s specifications. Details on pricing and availability have yet to be confirmed.